Days three and four of the mighty Inverness Film Festival were blighted by a couple of no shows: Of Gods And Men and A Woman, A Gun And A Noodle Shop. I wasn’t too fussed about not seeing the first, but had been massively looking forward to the second, a Wushu style remake of Blood Simple seemingly. Bum. I remember hearing once of a Science Fiction convention which ordered up a movie for their film programme. I forget which one. An SF movie beginning with S – Solaris or Saturn 3 perhaps. Anyway the print duly arrived from the distributors but, on inspection, turned out to be a copy of Shenandoah. It was sent back for replacement as a matter of urgency and at some expense. The replacement arrived the next day and was –ta da! – another copy of Shenandoah. The convention ended up showing Shenandoah at three in the morning to an appreciative audience. They’re a flexible-minded lot SF fans. I got three films in anyway. First off, Monsters. There’s been a lot of publicity about the big-balls on a budget exhibited by this film, and it’s all fair comment. 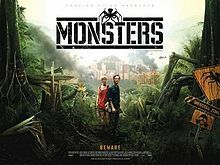 Brought in reportedly for under $500,000, with director Gareth Edwards claiming to have done the effects on his laptop, Monsters looks the absolute business. Set some years after an infestation of aliens has turned the territory between Mexico and the USA into a highly hazardous no-go area, the film follows the adventures of a rough diamond photo-journalist and a pampered rich girl as they try to negotiate their way back home after getting stranded in Mexico. The background is utterly compelling, and it is uniquely to the movie’s credit that the action takes place six years after the infection took root. There is no invasion trauma here. The characters pretty much all know what’s what, or, perhaps more importantly, think they do. I adored that aspect of the film. I was less entranced by the developing relationship between the two main characters as the story unfolded. The exemplars the director had in mind are probably Bogart and Hepburn in The African Queen or Gable and Colbert in It Happened One Night. These are noble role models, but Scoot McNairy and Whitney Able, delightful though they are, are not quite in this league. That’s a micro-quibble though. The film is another British triumph in a year which is already rich in them. The Edge Of Dreaming is a miraculous documentary. Directed by Amy Hardie, whose speciality is scientific documentaries, this is a shamelessly personal work that uses scientific methodology to approach a subject that initially comes across as “spiritual” or “supernatural”. Having had a vivid dream about her horse dying and then discovering the next day that he had, in fact, died during the night Hardie took it very seriously when she had another vivid dream about her former partner (now dead) telling her that she would die aged 48. Unable not to take it seriously, but sceptical of supernatural explanations Hardie then documented the year between her 48th and 49th birthday, and this film is the result. Without wishing to spray spoilers around: Hardie was diagnosed with a life-threatening illness during the year, but she didn’t die. The film is a highly moving interleaving of the personal and the detached. There are scientists talking about dreams, and how they might relate to perceived reality. There’s even a brief debate about the validity or otherwise of the word “reality” when talking about our consciousnesses and perceptions. Beyond the science though is the story of an intelligent woman and her loving family addressing the practicalities of mortality. Amy Hardie took part in a Q&A session afterwards. Her thoughtfulness and clear-sighted answers made this the highlight of the festival so far. 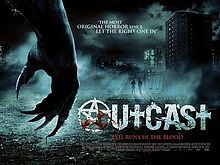 Outcast which is a macabre marvel: urban horror in the tradition of the Hellblazer comics, the works of Ramsey Campbell and early Clive Barker (his “good” period). I’d had low expectations because of the participation of James Nesbitt and my personal antipathy towards him. Possibly he’s a very nice guy, but I’ve always found him a bit of an enervating presence. I have a low tolerance for whimsical blarney, and I cannot abide a twinkle. No worries here though. He’s a revelation, channelling a seething Plutonic darkness that I would previously have thought well outside his range. He plays Cathal, a supernaturally tooled-up Irishman seeking his son who is in hiding under magickal protection in Edinburgh. Director and co-writer Colm McCarthy does an exemplary job of evoking a foreboding atmosphere. He’s particularly strong on eerie juxtapositions, contrasting the desuetude of central belt sink estates (fried breakfasts and dingy branches of R.S. MacColls) with arcane language and sigils daubed in blood on council flat walls. There’s a strong through-line, some good shocks and an ending I didn’t see coming. Great cast too though (in a classic Feexby moment) the girl I dismissed mentally as being a Karen Gillan wannabe turned out in the credits to be Karen Gillan. Outcast showed with a supporting short called I Love Luci. Written and directed by Colin Kennedy it’s neat, sweet and tidy. I laughed but, bloody hell Scotland, not so much of the puke and the poo next time, eh? I just finished watching The Edge Of Dreaming. What a moving and authentic documentary! I really envy your experience of having had Amy Hardie there to answer questions after you saw the movie. That must have been wonderful! I thought I was ready to comment on it, but I guess I’m still in need of processing time. Since the whole mortality issue is very fresh for me, I’m even more confused than usual. I’m also always more comfortable with the verbal give-and-take of a discussion than the sorting through my thoughts and feelings to put something coherent down on paper. This is especially true when the feelings are deeper than the thoughts, as in this case. 🙂 Again, I’m wishing there wasn’t an ocean between us. It was a privilege indeed and I was impressed at the level at which she was engaged with her film. It went far beyond a mere job and was clearly a part of her life which she had both experienced emotionally and analysed in a detached way. As I remember the Q&A session the audience were pretty plugged in too. Just looking at the blog post again I’m glad I was positive about Outcast. It’s recently been released on DVD in the UK and stands up very well to a second viewing. I just wish it had caught more peoples’ attention.